Location: On the north side of regent street to the west of Wrexham General station. Present state: The station building has been demolished. The former Wrexham Central platform has been shortened and is now Platform 4 of Wrexham General Station. 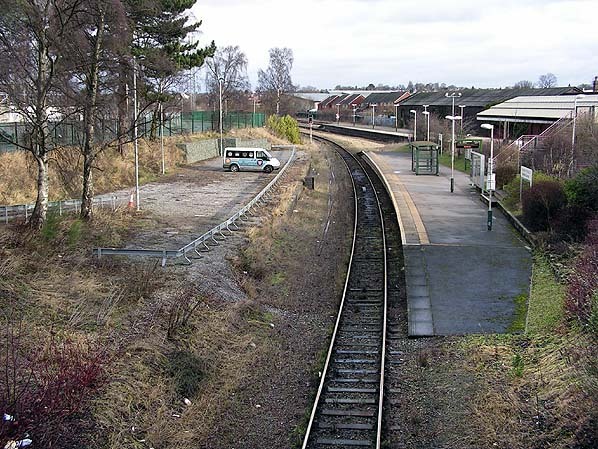 A short section of the former Bidston platform is extant and used for car parking. 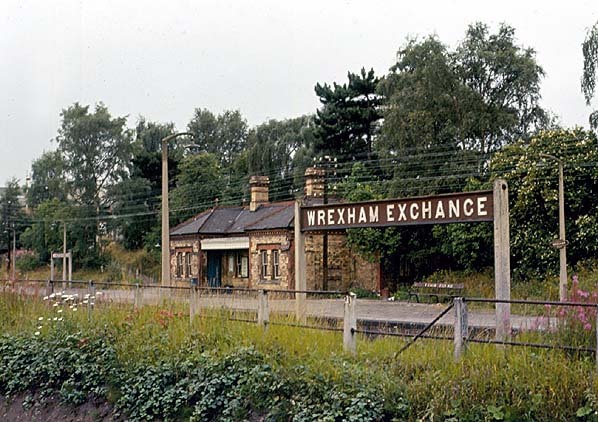 Notes: Wrexham Exchange, opened as Wrexham, was the southern terminus of the Wrexham, Mold & Connah’s Quay Railway (WM&CQR) which linked Wrexham & Buckley. It opened for goods services on 1st January 1866 and for passengers on 1st May 1866. The line made an end-on connection with the Buckley Railway a short distance north of Buckley Station, and it provided a through route to Connah’s Quay on the River Dee. One of the primary objectives of the WM&CQR was to take coal and other products northwards from Wrexham to the coast for onward shipment. station there was a siding on the west side of the line that was provided with a water tank. Further north again there were a carriage shed and goods facilities. Wrexham station was immediately west of the Great Western Railway’s Wrexham General station which had opened in 1846. By the 1860s it was on a main line route that linked Chester with London via Shrewsbury. When it opened Wrexham station had four trains to Buckley on weekdays and four return workings. The first departure was at 8.40 am and the last train arrived from Wrexham at 6.10 pm. The journey to Buckley took forty minutes. By 1878 the service to Buckley had increased to six trains. On 18th August 1882 the WM&CQR obtained an Act that allowed it to build a line 48 chains in length from Wrexham station into the centre of the town, and on 1st November 1887 it opened to passenger services to Wrexham Central. Wrexham station became a through station and was renamed Wrexham Exchange. Wrexham Exchange was improved as part of the works associated with the extension. It was provided with two platforms as the section of line at Exchange had become double-track. A single-storey double-fronted brick building was provided on what became the Buckley direction (‘down’) platform. The building was of yellow brick which was much favoured by the WM&CQR. On the Wrexham Central (‘up’) platform a simple wooden waiting shelter was provided. 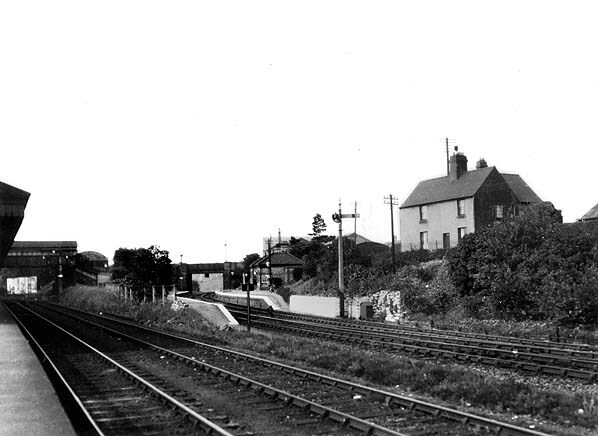 A footbridge gave access to the GWR station.There were still six trains per day to Buckley. Exchange from Brymbo, with eight return workings, the last leaving Wrexham Exchange for Brymbo at 10.07 pm. The service proved very popular with Brymbo residents who travelled into Wrexham for shopping trips and particularly on Saturday afternoons to visit the pubs in the town. service included six extra trains to Wrexham Exchange from Brymbo with eight return workings the last leaving Wrexham Exchange for Brymbo at 10.07 pm. The service proved very popular with Brymbo residents who travelled into Wrexham for shopping trips and particularly on Saturday afternoons to visit the pubs of the town. On 31st March 1890 two new sections of line opened that gave wider opportunities to travel from Wrexham Exchange. The lines created a through route between Wrexham and Chester, and they had come about because the WM&CQR had entered into a partnership with the Manchester, Sheffield & Lincolnshire Railway (MS&LR). The WM&CQR built a new line from Buckley Junction, to Connahs Quay and Shotton via Hawarden. Known as the Hawarden Loop, construction began on 6th September 1887. The MSLR built a line from Chester to Connahs Quay & Shotton thereby creating the through route. The WM&CQR and the MS&LR were thus able to compete with the Great Western Railway. With the opening of the through route Wrexham Exchange began to be served by four through trains each weekday between Chester Northgate and Wrexham Central, hauled by MS&LR locomotives. The WM&CQR also operated services to Connahs Quay & Shotton. From 18th May 1896 passengers using Wrexham Exchange were able to travel to Liverpool via a line, jointly sponsored by the WM&CQR and the MS&LR, between Hawarden Bridge and Bidston. Bidston was on the Wirral Railway (WR) and through agreement with them services from Wrexham were, after 1898, able to run to Seacombe from where a ferry operated to Liverpool. The building of this new line effectively bankrupted the WM&CQR and the receivers were called in. On the 1st January 1905 the GCR formally took over the WM&CQR. They had controlled the line since the receiver was called in so in reality there was little change; however WM&CQR locomotives were hurriedly repainted in GCR livery. The GCR introduced a ‘Railmotor’ onto its Brymbo service in 1905 in a bid to win more passenger traffic. From 1st March 1917 the Brymbo service was withdrawn. The trains had ceased to be viable owing to competition from the GWR and new bus services. Passengers were still able to travel from Wrexham Exchange to Chester, Seacombe and Ellesmere. On 1st January 1923 the GCR was absorbed into the London & North Eastern Railway (LNER). Wrexham became the most westerly point on the LNER network. The LNER continued to operate services to Seacombe and to Chester. Midland Region before the end of 1948. In 1950 there were eight trains to Seacombe, six to Chester and eight to Ellesmere. With regard to the pattern of services at Wrexham Exchange very little changed in the first decade of nationalisation. In February 1958 there were five weekday trains to Chester Northgate with two extra workings on Saturdays. Three services ran to Chester Northgate on Sundays. Ten trains ran to Seacombe between Monday and Friday which increased to eleven on Saturdays. Only one train ran to Seacombe on Sundays. There was also a single service on weekdays that ran only to Hawarden Bridge. It left Wrexham Exchange at 7:02 am. On Sundays there were two trains that ran to Hawarden Bridge. With effect from 4th January 1960 the Seacombe trains were diverted to run to New Brighton. Train services went over to DMU operation in the early 1960s but occasional steam workings did operate from time to time. The Reshaping of British Railways (Beeching) report of 1963 recommended that Wrexham Central should close to passengers and the services to Chester and New Brighton be withdrawn. augmented by two trains that ran only as far as Hawarden Bridge. The first weekday departure in the Summer of 1964 was for New Brighton at 5:05 am. The last was for Chester Northgate at 9:43 pm. There was a later train to Chester Northgate on Saturday evenings which departed at 10:52 pm. A very late working from Chester Northgate arrived at Wrexham Exchange at 12.15 am. 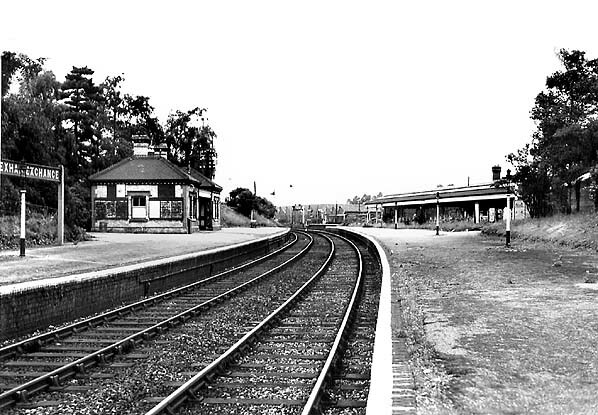 Closure of the line was threatened in November 1965 but a storm of protest led to a reprieve. The May 1968 timetable showed ten Monday to Friday services to Chester Northgate with sixteen on Saturdays. Five trains ran to Chester on Sundays. There were twelve trains to New Brighton Monday to Saturday and eight on Sundays. Two services ran to Hawarden Bridge on Sundays. The first weekday departure was still the 05:07 to New Brighton and the last was still the 22.52 to Chester Northgate. The late night Saturday services to and from Chester also still ran. In March 1968 the withdrawal of the service to New Brighton was deferred by the Transport Minister Barbara Castle MP. However withdrawal of the Chester service was approved, and the last Chester Northgate trains departed from Wrexham Exchange on 9th September 1968. Saturdays there were twenty trains and on Sundays eight. There were also two trains to Shotton only that ran on Saturdays. The last arrival on weekdays was the 23:49 from New Brighton. On Saturdays the last New Brighton train reached Wrexham Exchange at 00:19. The service was basically hourly throughout the daytime on weekdays. On 4th January 1971 the New Brighton service was diverted to Birkenhead North between Monday and Saturday; Sunday services continued to run to New Brighton. On 11th January 1976 the Sundays-only service to New Brighton was diverted to Birkenhead North. By May 1977 there were 22 Monday to Friday trains to Birkenhead North, with nineteen on Saturdays and four on Sundays. The first Monday to Friday departure was at 05:17 and the last arrival was at 23:54. On Saturdays there was an arrival at 00:14. There were only four trains on Sundays. With effect from 2nd October 1978 the Birkenhead North service was cut back to Bidston when the Merseyside Passenger Transport Executive withdrew funding for it. demolished. The ‘up’ platform was also shortened during the 1980s. In 2011 remains of the ‘down’ platform could still be seen. Wrexham Exchange station looking north from the up (towards Wrexham Central) platform in the British Railways era. The yellow brick building on the northbound platform was an original WM&CQR structure. 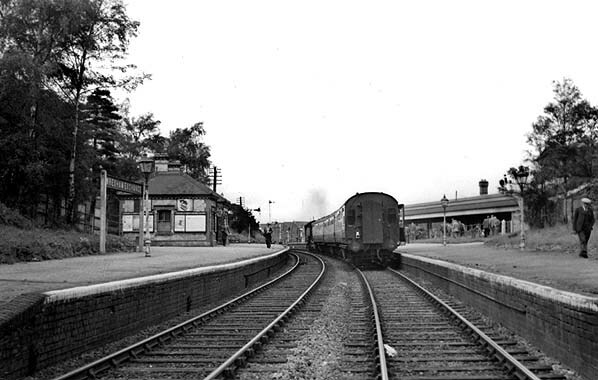 Looking north at Wrexham Exchange station in October 1955. A northbound train prepares to depart. Looking south towards Wrexham Exchange station from Wrexham General Station in the middle of the 20th Century. The picture clearly illustrates the close proximity of the two stations. 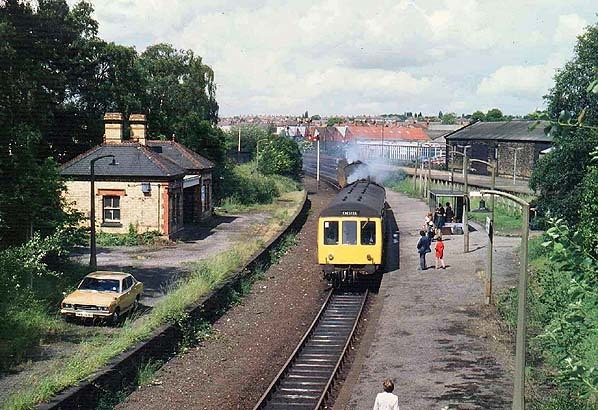 Looking west towards Wrexham Exchange station from the north end of Wrexham General station in August 1973. At this time the station still had its yellow brick building which dated from 1887. The WM&CQR favoured the use of yellow brick at its stations. In June 1980 a DMU is seen at Wrexham Exchange station. 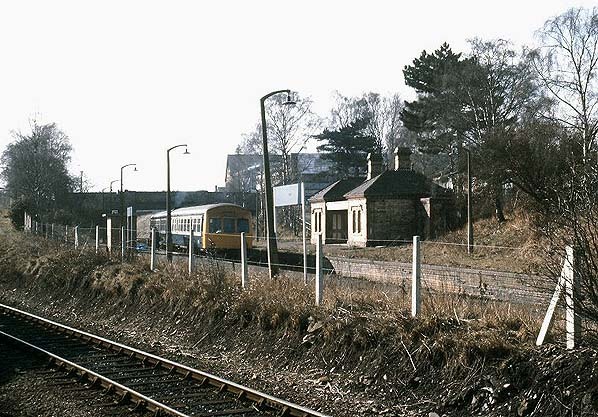 Although the line had been singled through the station the original yellow brick building was still standing. The DMU has Chester displayed as its destination but it was heading for Wrexham Central. Twelve years earlier regular services from Exchange to Chester Northgate ceased to run. Looking south towards what had been Wrexham Exchange station in March 1985. The picture is taken from the north end of Wrexham General station into which the former Exchange 'up' platform had been absorbed in 1981. A two-car Metro Cammel DMU waits in the platform. The yellow brick building seen in this view on the former 'down' platform had been out of use for many years by this time. The site of Wrexham Exchange station after it had ceased to exist as an independent station as seen looking north in 1987. 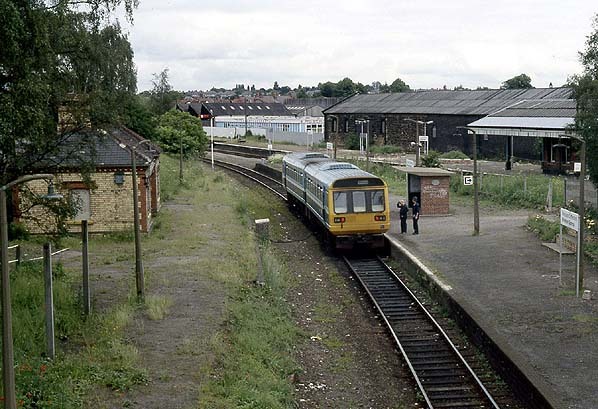 By this date the former up platform had been absorbed into Wrexham General station and it had become a bi-directional platform serving trains running between Wrexham Central and Bidston. The former northbound platform and station building from Wrexham Exchange were still standing. 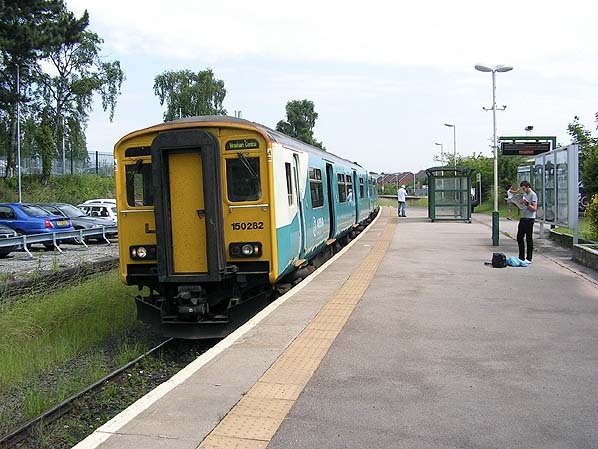 In June 2009 an Arriva Trains Wales 'Borderlands' service calls at the former Wrexham Exchange station on its way to Wrexham Central. Since 1980 the former 'up' platform of Wrexham Exchange has been part of the Wrexham General station. Former Wrexham Exchange station looking south towards Wrexham Central in June 2010. The site of Wrexham Exchange station looking north in February 2011. 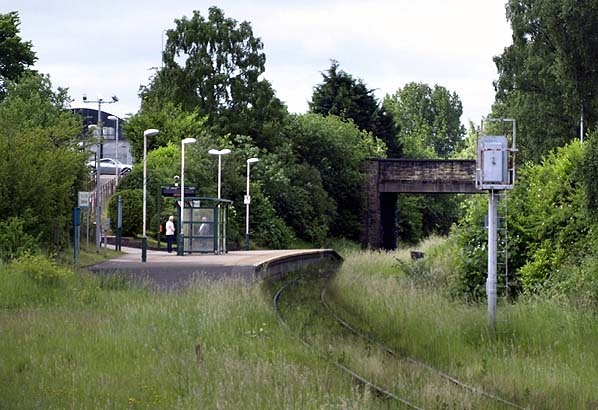 The station closed in 1981 but a section of the former 'up' platform which served trains heading to Wrexham Central was shortened and absorbed into Wrexham General as a bi-directional platform that is used by trains running between Wrexham Central and Bidston. Note that the glass shelter seen in the 1980 picture above had been replaced with an open-fronted brick shelter by 1987 which, in turn, had been replaced with the glass shelter seen in this picture.